Music and design have long had a close affinity and is something recognised by music giant Warner Music UK. It wanted new, 'exciting' spaces that were attractive to artists and employees, after deciding to bring the company's various record labels closer together. 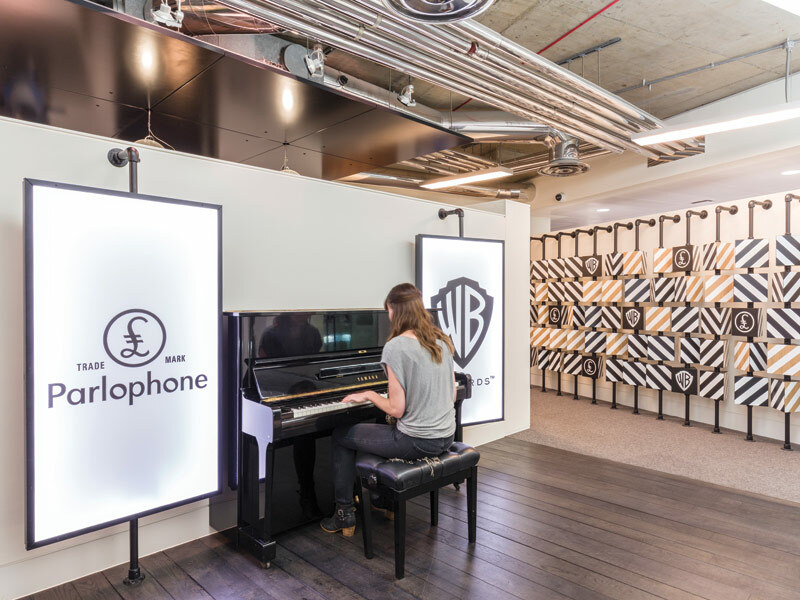 Warner Music commissioned Woods Bagot to do a major refurbishment and fit-out project on one of its three new spaces in Kensington, London, transforming it into Warner Music's new London HQ. It is home to the company's key labels, including Atlantic, East West, Parlophone, Rhino and Warner Bros. 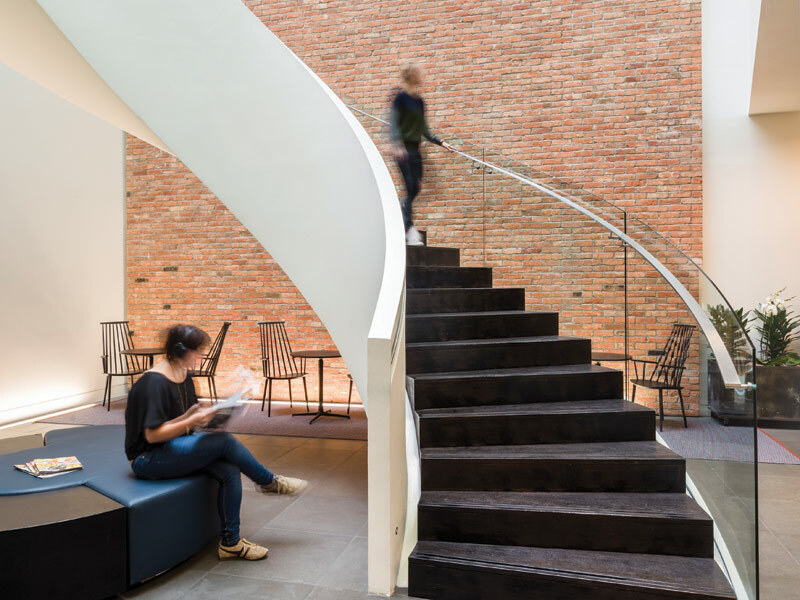 In addition to the modernisation and refurbishment of the existing building that celebrates the distinct identities of each label, Woods Bagot needed to create a flexible work environment that 'strives to cater for the needs of the business and its people'. 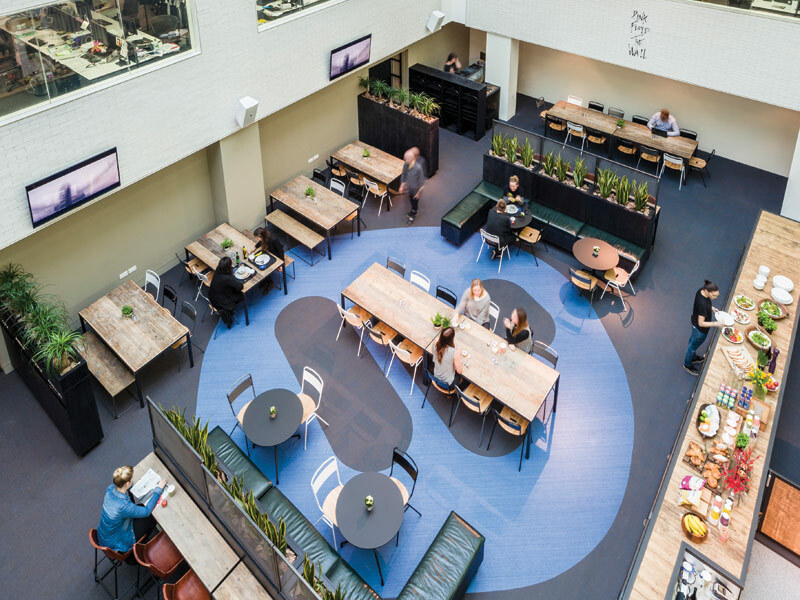 This was a critical feature from the outset, with Warner Music requiring the design practice to provide a solution that would be 'responsive to a diverse range of work styles, which would in turn give individuals and teams the freedom to choose from a menu of different spaces that met their needs'. The existing sweeping staircase was retained and restained, and a graphic of an airship added to the wall. Woods Bagot's solution was to design multifunctional spaces and maximise on space effectively. Across the general office and floor levels one to five the design scheme takes on various forms - from fully built to semi-open and open spaces - that are equipped with enabled technology suited for task, from listening to music tracks to communal brainstorming. A number of social spaces have been included in the scheme to allow for 'reflection and refresh', with staff encouraged to spend time away from their desks. On the ground floor a reception was created to represent Warner Music's core values, of expressing the music industry without feeling like a corporate office. Woods Bagot used a 'shop front' approach to the design scheme, thanks to a glass frontage, with passers-by drawn in by a warm and inviting atmosphere and use of a considered palette of materials. 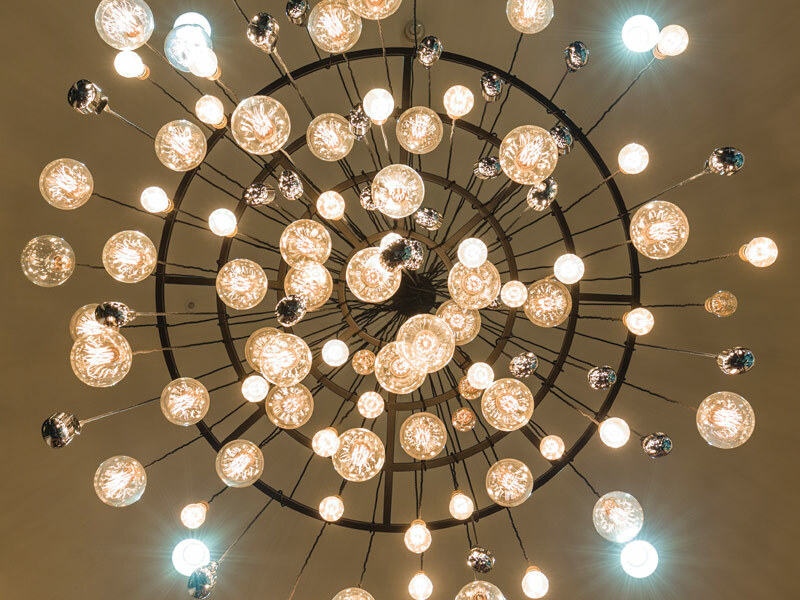 A magnificent chandelier, created using 80 glass light bulbs and 28 retro microphones, also features in the space. 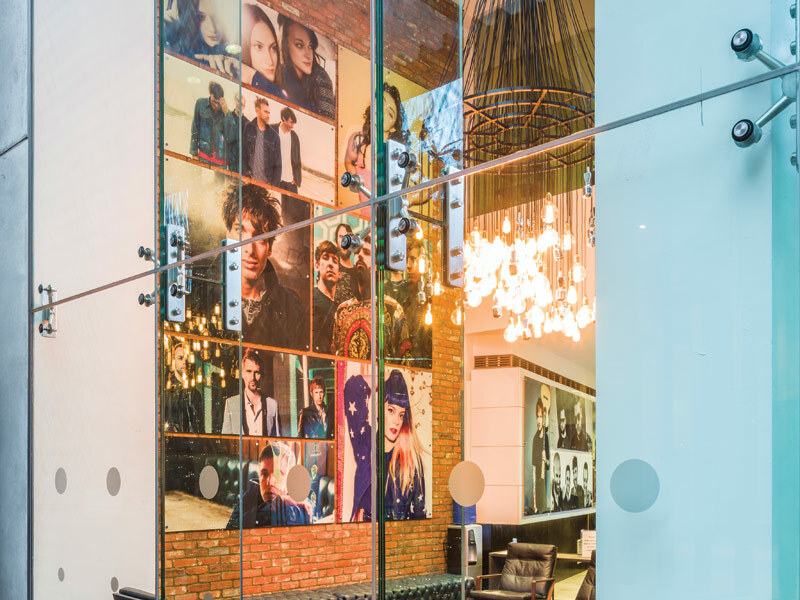 Bespoke poster displays - with planter bases - wrap the inside of the curved facade celebrating the success of Warner Music artists and connecting the public with the business. The chandelier hangs in front of an existing brick wall filled with portraits of major artists from key labels. 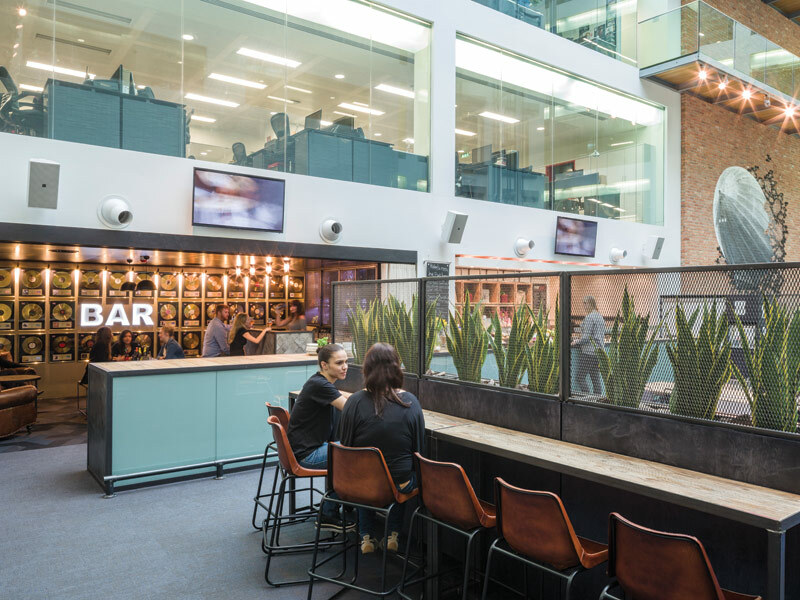 Designed using new and reclaimed furniture and finishes, the space connects to the 'beating heart of the business'. 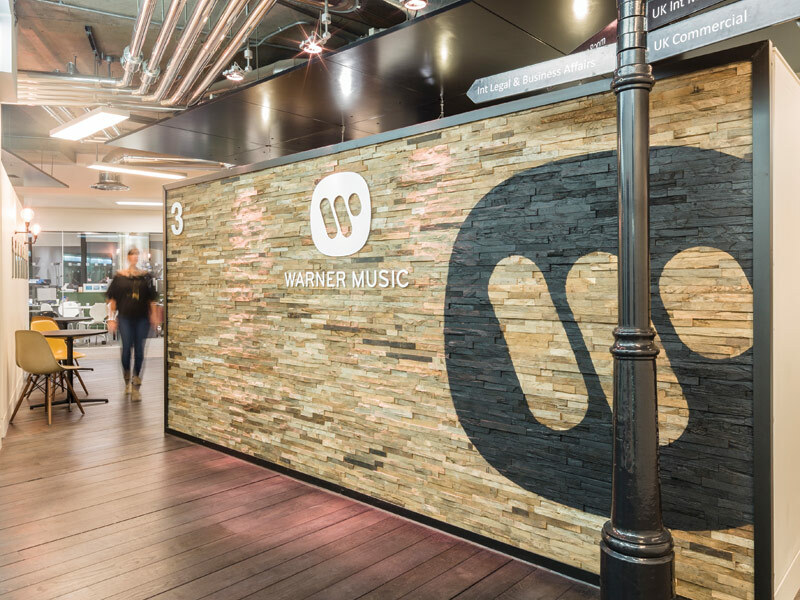 Visitors and staff can view the creative and innovative work Warner Music produces on the ascending floors, thanks to the high level of transparency. But while they are bright and airy spaces, lighting levels on each floor are subdued, ceilings are exposed, retained timber floors stained black, and black-painted window frames are surrounded by a distinctive deep green finish that runs along the perimeter of each floor. The project incorporates recycled and reused materials throughout. Much of the existing infrastructure was kept and repurposed. The reception desk was reclad, the timber floors were stained, and office furniture was reused. Additional furniture was largely sourced second-hand, online or from vintage collections, and enhanced. Sustainable materials such as plywood were used on the new joinery elements and furniture, while reclaimed timber planks were used as cladding on feature walls and in the artists' lounge.